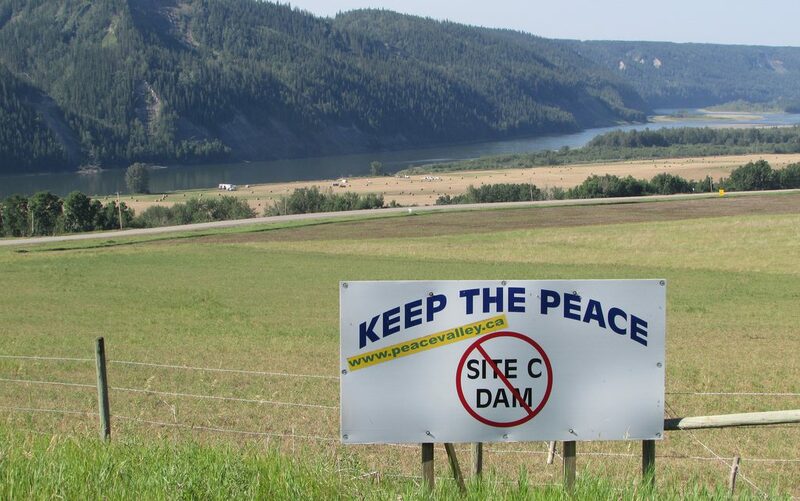 Keep The Peace - An Anti-Site C Dam Sign, with the Peace River in the background. Clean Energy Act is paving the way for "clean" projects, and exempts them from impacts evaluation and consultation with local inhabitants. However, First Nations, Landowners and Environmentalists Resist this controversial dam in British Columbia. The Site C Project is a large earth-filled dam currently under construction on the Peace River, near the city of Fort St Johns, British Columbia. 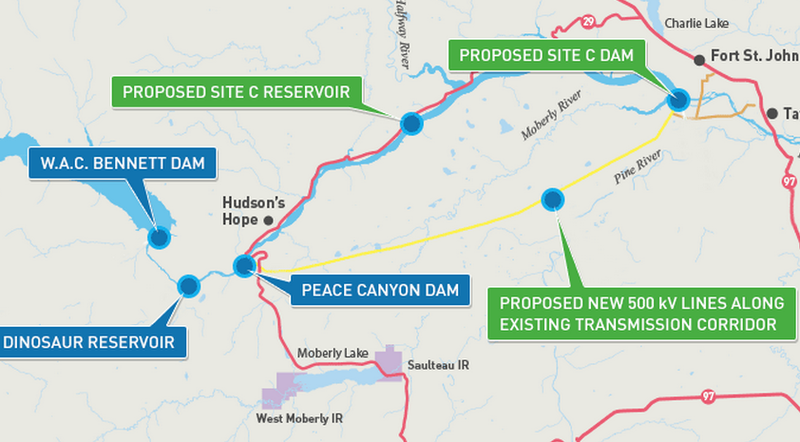 If completed, it would be the third in a series of dams on the Peace River, which already contributes one third of the energy produced in the province . In an attempt to tap into the energy producing potential of the Peace River, and despite objections from land owners, First Nations, environmentalists, scientists, and the government appointed chair of the Joint Review Panel for the project , construction of the Site C Dam began in 2015, with several problematic implications. Chief among them is the reservoir, which will flood 9,330 hectares of some of North-Eastern B.C.’s most fertile agricultural land; the homes of local property owners; farms; forest; and Aboriginal, and non-Aboriginal cultural heritage sites . Several local groups have mobilized against the project, the most vocal among them being the landowners and farmers of Peace River Valley, and the Treaty 8 First Nations. In 2015, the landowners and farmers of Peace River Valley officially launched a legal challenge against the Site C Project, arguing that the government ignored several key concerns raised by the Joint Review Panel, including; the environmental impacts, the cost of the project, and the fact that the government hadn’t actually demonstrated any need for the project . Treaty 8 First Nations also launched legal challenges to the Site C Project, arguing that they were not properly consulted, and that there are potential infringements of First Nations’ rights guaranteed under Treaty No. 8 . The environmental assessment process chosen for the project by the federal government of Canada and the provincial government of British Columbia, did not consider whether or not the approval of the Site C Project would constitute an infringement, nor did it comprehensively assess the cumulative environmental impacts, and their related impacts to First Nations rights . The aforementioned omission was able to occur because of the passing of the British Columbia Clean Energy Act, in April of 2010. The Clean Energy Act altered the landscape of how energy projects in British Columbia are planned and evaluated, and in the context of the Site C Project, exempts the project from sections 45 to 47 of the Utilities Commissions Act, removing the requirement of a Certificate of Public Convenience and Necessity. The exemption of the project from this certificate removed certain procedural requirements related to the consultation of First Nation groups . Furthermore, the Joint Review Panel (JRP), which was formed by both the Federal and Provincial governments once BC Hydro submitted the project description to the Canadian Environmental Assessment Agency (CEAA) and the BC Environmental Assessment Office (EAO) in May of 2011, was limited by the Crown in the scope of what they could conclude or recommend about the project. Specifically, the Panel was forbidden from expressing views on Treaty No. 8. Violations, or whether the Crown met its duty to Aboriginal groups . Although the JRP was limited in what they were able to conclude, they found that there were significant potential adverse effects on the activities of First Nations, such as; on fishing opportunities; on hunting and non-tenured trapping; on traditional uses of land; on current use of lands and resources; on heritage resources; and on cultural and heritage resources for both Aboriginal and non-Aboriginal peoples . In the Consultation and Accommodation report, the Federal Government’s Decision Statement, and the Provincial Government’s Environmental Assessment, the question of infringement was completely absent . Environmental Impacts: The findings of the JRP indicated that the Site C Project would have significant adverse environmental effects. These adverse effects are categorized under; Aquatic impacts, Vegetation impacts, Wildlife impacts, Impacts to Aboriginal use, Impacts to Cultural Heritage, and Others. To see a full list of effects, see Report #2. Of importance is that there were 21 potential environmental impacts, and that in a Federal context the approval of a project with even 1 or 2 environmental effects is not considered a trivial matter . 1981-1983: BC Utilities Commission removes the Site C Project from planning during public hearings as BC Hydro had not considered energy prices, or demonstrated any need for the project . 2010: BC Clean Energy Act was passed; exempting the project from a Certificate of Public Convenience and Necessity . 2014: Site C Project gets approval . 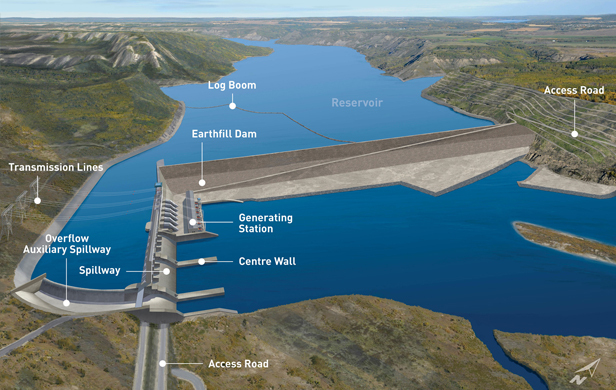 Project Details The Site C Project is a large earth-fill hydroelectric dam being constructed on the Peace River in North-Eastern British Columbia, Canada. The dam's estimated peak capacity is 1'000MW, with an average capacity of 680MW, and an estimated production of 5'100GWh of electricity per year. If completed it will be the 4th largest producer of energy in the province of British Columbia. The Dam is to be 60m in height, 1'050m in length, and have a reservoir with the surface area of 9'330ha. The Estimated Affected Population is hard to determine as there is a lack of information about how many farms, ranches or homes would be lost due to the flooding. The Affected Population given here is that of the West Moberly First Nations, and that of the Prophet River First Nations; however, this a conservative estimate and the actual population affected by the project is likely larger. The New Democratic Party of British Columbia (BC NDP), backed by the Green Party of British Columbia, formed a minority government in the provincial elections of 2017, and commissioned an independent review by the British Columbian Utilities Commission, who released a final report on November 1st. You can find the report attached in the Sources and Materials section. Development of Alternatives A Study conducted by the University of British Columbia's evaluated several alternatives to the Site C Project, which include; Upgrading Existing Hydroelectric Dams to Increase Energy Production; Municipal Solid Waste Incineration; Wind Energy; and Natural Gas . Why? Explain briefly. We are awaiting a final decision by the New Democratic Party of BC on whether construction of the Site C Dam will continue. As construction of the dam had already begun under the previous government, environmental degradation has already occurred, and regardless of whether or not construction will be halted, and the area restored, the project will place a heavy burden on the British Columbian tax base, which will likely result in a rise of hydro-electricity rates across the province. Stuart, Ryan. 2017. "Out of Sight, Out of Mind; Site C Mega-Dam Threatens the Peace River." The Sierra Club. Bakker, et al.. 2016. 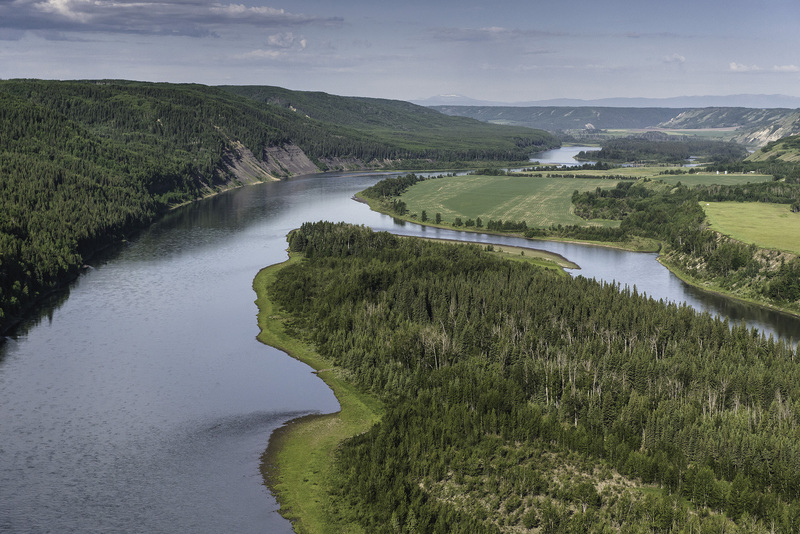 "Report #2: Assessing Alternatives to Site C (Environmental Effects Comparison)". Program on Water Governance, University of British Columbia. Gillis, Damien. 2015. "Landowners launch Site C Dam court challenge, First Nations next." The Common Sense Canadian. BCUC. 1983. "BC Hydro Energy Project Certificate Application for Site C". British Columbia Utilities Commission. Deloitte. 2017. "British Columbia Hydro and Power Authority - British Columbia Utilities Commission Inquiry Respecting Site C - Project No. 1598922" Deloitte LLP. The Tyee "Halting Site C Now Will Save Up to $2 Billion, Says UBC Report"
VIDEO: Energy Expert: Site C Dam "fundamentally uneconomic"
Keep The Peace An Anti-Site C Dam Sign, with the Peace River in the background.